First, remember to ask for a high-fidelity simulation. You need high-fidelity to notice and understand many important wind effects, such as turbulence and wind gusts. Simply put, computational simulation is to use a computer to solve the mathematical problem of fluid flow. Simulating in a digital environment what happens in real life is a useful feature in many industries nowadays! And to do so, there are many different methods. This video shows two of them. What you see are identical turbulent flow conditions solved with two different solvers or with different models. The first one describes the average wind field. Called Reynolds-averaged Navier-Stokes (RANS) or low-fidelity simulation. 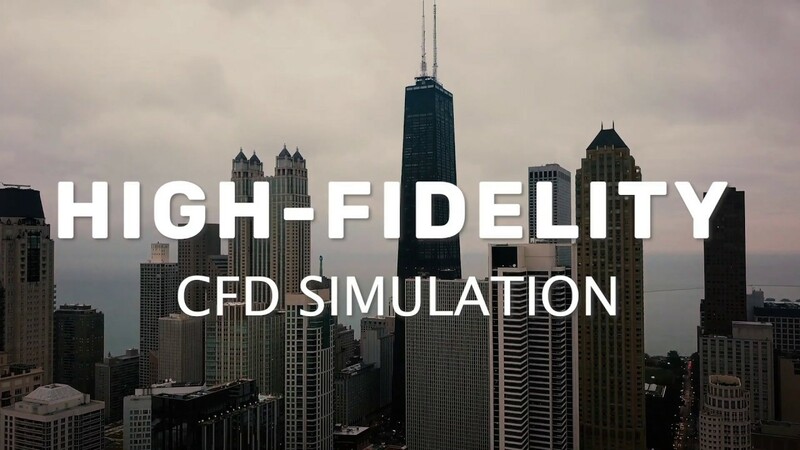 It requires a relatively small amount of computational power and it’s often the most cost-effective way to run a CFD-simulation. The second one shows in the detail the vortices and the turbulence behavior over time. This method is called large eddy simulation (LES) and is also referred to as a high-fidelity simulation. Not every software solution uses the sufficient computational power to run a high-fidelity simulation. However, LES is the only ones that captures the complex scenario that the wind form in an urban area. So, in this particular case LES, is definitely MORE. At least when using Ingrid Cloud. When you hire a wind simulation consultant, make sure you tell him to use Ingrid Cloud -he fast and affordable way to run accurate high-fidelity simulations.